I’ve been following the progress of The Sweety House on Clerk Street since it opened last year, but haven’t yet visited mainly because of my lack of sweet tooth. 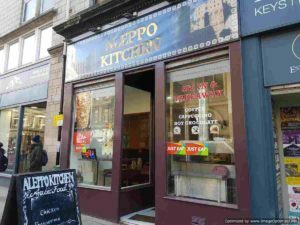 I was pleased to hear that their success had spawned a second shop in the shape of Aleppo Kitchen with an entirely more savoury selection. On the site previously occupied by Cafe Grille, just opposite Cafe de la Poste, things still feel like they have some bedding in to do. But this was fine as I was in takeaway mode. From their very broad selection I settled upon their Arabic falafel. This comprised hummus, falafel, tahini, and broad beans served in Arabic flatbread (£5). This came served with dill pickles and seasoned chips. This was cooked to order by the friendly counter folks who deftly managed a brisk queue of people keen to sample their wares. 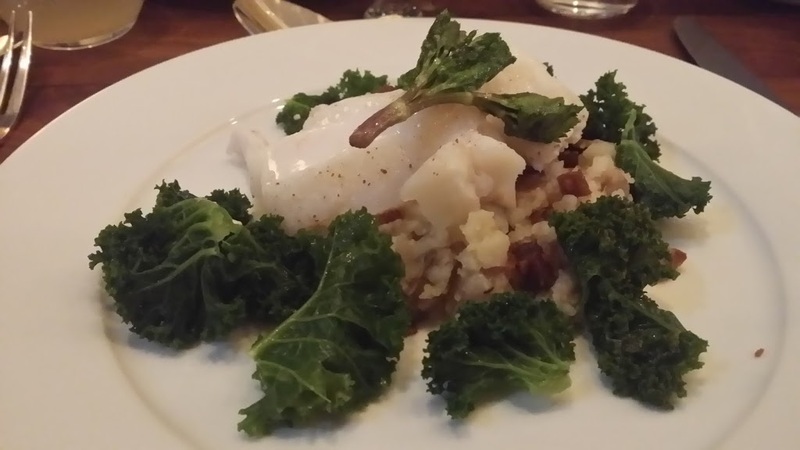 When it arrived it was a veritable trough of food. Seriously, I looked an absolute picture as I cradled the monster tray of goodies walking down the street. The falafel proved really very good. 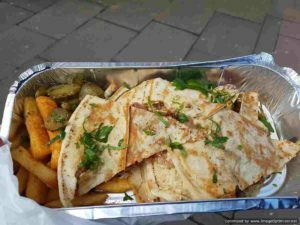 A whole wheel of flatbread had been sliced into wedges with the filling generous to the point of overflow. The nutty balls packed good crispness and flavour and the accompaniment made for good eating. The pickles were excellent and the chips were very good too making it a memorably tasty lunch. So overall, I was very impressed with my first of many visits to Aleppo Kitchen. I am fortunately within their delivery area so look forward to sampling more dishes delivered to the lazy comfort of my own home. Whether doing likewise or sitting in it’s a place I’d recommend to you at your next available oppprtunity.